Santa Fe has long been a point of meeting…a point of meeting for people, for culture, for commerce and for landscape and a tradition of welcoming old and new alike. The more you come to know Santa Fe – its in-town neighborhoods and near-by communities, the greater appreciation you will have for it as a remarkably live and fluid work in progress and a wonderful, vibrant place to call home. In-Town Historic Areas: Santa Fe’s historic Plaza has long been the centerpiece of the city and the place from which all distances are measured or considered. The Plaza is at the center of the traditional government, arts and commercial district which is bounded by the loop created by Paseo de Peralta and Guadalupe Street. Santa Fe’s older historic neighborhoods, like spokes in a wheel, surround the central Plaza area. The Historic Eastside is east of the Plaza and of one of the oldest and most popular areas of town. Streets here wend their way through smaller neighborhoods. Many of the homes are of adobe construction. Streets like Acequia Madre, Canyon Road, Garcia Street, Camino del Monte Sol, Cerro Gordo and East Palace Avenue are filled with homes large and small that resonate with charm and authenticity. From the Historic Eastside and Camino del Monte Sol, the much sought after neighborhoods near St. John’s College include Camino de Cruz Blanca, Museum Hill – off the Old Santa Fe Trail, Camino Rancheros, Sun Mountain Estates and Wilderness Gate. Artist Road/Hyde Park Road on the north side leads from town near the Scottish Rite Temple and Fort Marcy Park to the Santa Fe Ski Basin. The road climbs towards the peaks of the Sangre de Cristo Mountains and off it are a myriad of communities including Estancia Primera, with its enclaves of Los Nidos, Los Altos, Los Altos Norte and Kachina Heights, Vista Canada Ancha, Sierra del Norte, Los Cerros Colorados, Santa Fe Summit and Santa Fe Summit South. The mountains are a beautiful setting and many of the homes in this area have compelling views. Two blocks north of the Plaza, Washington Avenue changes its name to Bishops Lodge Road. Off Bishops Lodge and to the west are another series of neighborhoods, a mix of old and new, with many housing options including condominiums on the North Hill and single family residences large and small. Bishops Lodge Road climbs a series of ridges and a multitude of neighborhoods like Brownell Howland, Camino Encantado, Tesuque Ridge and Circle Drive before gently reaching the Bishops Lodge Resort and Tesuque Village beyond. West of the Plaza are historic neighborhoods off Agua Fria and West San Francisco Streets. Many of the homes are adobe and are part of compounds or clustered on narrow streets and winding lanes. Nearby is the Guadalupe District which includes the recently re-invented Railyard district with loft-style housing options, Sanbusco Market Center, Railyard Art Galleries, SITE Santa Fe and the Santa Fe Farmers Market. To the south of Paseo de Peralta and west of the Old Santa Fe Trail is the historic South Capitol District. A mix of architectural styles including Pueblo Revival, Arts and Crafts, Territorial and contemporary lofts can be found here. Galisteo Street and Don Gaspar Avenue are among the main thoroughfares and there is nearby shopping on Cordova Road and at Whole Foods. Beyond the Historic and Within the City Limits: As you move through town to the south and the west, there are numerous wonderful neighborhoods large and small including DeVargas Heights, Los Senderos, Sol y Lomas and Quail Run to the southeast and Casa Solana, Casa Alegre, Las Lomas, Coyote Ridge and Vista Encantada to the West off Alameda and Agua Fria. To the south, off Rodeo and Zia Road, communities like design award-winning Nava Ade, Los Caballeros, Park Plazas, Villas de la Toscana, Pueblos del Sol and Pueblos de Rodeo to name a few are close by the Santa Fe County Rodeo Grounds and Chavez Community Center, a complete venue for athletic facilities. Rolling terrain, big views to the west of the Jemez Mountains and to the north and east of the Sangre de Cristo Mountains define this landscape. Here you will find Las Campanas, Santa Fe’s pre-eminent golf community with additional amenities including clubhouse with fitness equipment, pool and restaurant, horse facilities and more. Las Campanas encompasses a large swath of land and opens from the main access road – Las Campanas Drive – through a series of gated entries. The community offers a variety of housing options including patio homes freestanding homes and multistory residences. Premium lots include fairway views as well as mountain views. Outside of Las Campanas are a series of smaller communities many of which are accessed off of Camino la Tierra or Las Campanas Drive. Under the umbrella of Las Tierras, you’ll find La Tierra, La Tierra Nueva and Tierra del Oro. Others communities include Tessera, La Vida, La Serena, Los Suenos, La Mirada, Salva Tierra and Sundance Estates. . While lot sizes will vary, most are somewhere between 1.0 and 12.5 acres. Other wonderful and view-filled areas are off Tano Road including Monte Sereno and Heartstone. While some of these communities are gated, most are not. Lastly, in a more planned village-like setting with open spaces, paved access and walking trails, is the Aldea community. Patio and single family homes in single and multi-level formats are found here. As you head north from Santa Fe in close proximity to town, you’ll find the dramatic and varied landscape around the Santa Fe Opera and Village of Tesuque. The Santa Fe Opera is world renowned, offering performances of innovative and traditional opera with outstanding casts of established performers and new, up and coming talent. The theatre itself is wonderful architecturally and inhabits a stunning site. Adjacent to it, on Tesuque Pueblo land is the Flea Market. Adjacent to the Opera are two communities, Casas de San Juan – a mix of luxurious single family homes and attached and free-standing condominiums in a stunning and view-filled setting and Monte Sereno, one of Santa Fe’s newest communities offering single family homes and home sites. Architectural styles here run the gamut from the vernacular pueblo revival to outstanding contemporary design. Not far away are the Village of Tesuque and the Tesuque Pueblo. The historic village runs along the Tesuque Creek. Like several other villages in the area, Rio En Medio and Chupadero, the river bosque offers deciduous trees and a lush, green setting. 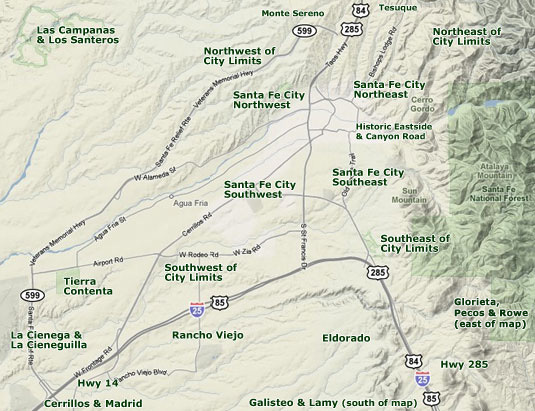 Tesuque has homes large and small, with estate properties and easy access to hiking and the Santa Fe National Forest. In the village is the Tesuque Market and Restaurant, El Nido Restaurant, an elementary school and post office. Just beyond Tesuque, on the way to Rio y Medio are the residential communities of Los Caminitos and Vista Redondo. Here you will find stunning hilltop residences on 5+ acre parcels. Travel time to Santa Fe centro is perhaps 15 minutes but you have the distinct feeling of being in the country. With views of the Santa Fe National Forest and west to Las Barrancas, the Jemez Mountains and other mountain ranges as far away as Colorado, the landscape is breathtaking. A new and welcome addition to the area is the Encantado Resort and Spa, apart of the Auberge Resorts Group, is on the site of the old Rancho Encantado. The award winning Terra restaurant is located here. Among the wonderful things about Santa Fe is that as you travel away from the city center, each direction offers a new terrain, each with characteristics inherent to the high desert yet varied and unique. Here within moments of the Sangre de Cristo Foothills, the Sandias and Ortiz Mountainsand Cerrillos Foothills loom larger than the Jemez Mountains to the west. You first reach Arroyo Hondo, Sunlit Hills and Hondo Hills. All are accessed off of the Old Las Vegas Highway, affectionately also calledthe High Road to Eldorado. Arroyo Hondo is horse country. A flatter yet rolling terrain that is ideal for riding out. Minimum acreage here for a single family home is 2.5 acres. Many of the homes are on larger properties and include horse barns and arenas. Sunlit Hills is true to its name – populated with hills and ridges, many with excellent tree cover and big views. The Hondo Hills community is similar, generally 2.5 acre + home sites on pinon and juniper covered lots. Along the way are classic roadside eateries like the Bobcat Bite and Harry’s Roadhouse and a wonderful new B & B called Terrain Santa Fe. Nearby is the El Gancho, a local fitness center with tennis facilities. Approximately 6 miles past the city limits – off US 285 South, you reach the Eldorado Area. Comprised of a number of different communities, Eldorado at Santa Fe being the largest, it is easily accessed from the Old Las Vegas Highway or by hopping on I-25 North for one exit. The design of the Eldorado community focused on 1+ acre lots interwoven with 987 acres of open spaces also referred to as greenbelts. The original community plan encouraged solar design and night sky rules and regulations that include down-cast exterior lighting which help to keep the stars luminously in view at night. Many other subsequently developed communities incorporated this concept into their design regulations. Eldorado is also unique in that it has a 4000+ acre Wilderness Preserve for the exclusive use of its residents. Hiking trails and marked paths offer an abundance of outdoor adventure opportunities. Other Eldorado area communities include La Paz at Eldorado, Belicia, Dos Griegos, Alteza and the Ridges. Depending upon the property, the latter 3 may offer some some higher ground.Horse lovers often chose the Los Caballos and Sun Ranch communities where lots are generally 10+ acres. Farther south on US-285, still within 20 minutes of the heart of Santa Fe are the Art Barns and Spirit Wind Ranch communities. The former is focused on pitched-roof Northern New Mexico design homes. Beyond are the traditional villages of Lamy and Galisteo, each with their own special flavor. Lamy is the location of our local stop on the Amtrak main line and features a wonderful train station, historic church and small restaurant The Lamy Station Cafe in a railroad car. The village and its outlying areas offer a varied choice of freestanding homes, some old and some of newer vintage. Just beyond Lamy is the Village of Galisteo and its outlying environs. The light and landscape of the Galisteo area has attracted artists and sojourners for as long as people have been present in Northern New Mexico. The Village is itself, a community including historic homes and structures along the Rio Galisteo bosque, some dating back to the 1800’s. There is a wonderful old church at the crossroad and a series of beautiful streets like La Vega, Via La Puente and Marcellina Lane. Beyond is the Galisteo Basin with pueblo remains, petroglyphs and amazing rim rock formations. Outside the village as well is the residential community of Ranchitos de Galisteo and the amazing new community coming together as part of the Galisteo Basin Preserve on the old Thornton Ranch. The Preserve includes the emerging enclaves of New Moon Overlook, Southern Crescent, Conservation Ranches, East Preserve and Trenza – the Village. Each offers unique opportunities in high desert living in a land conservation and community development area designed to be in harmony with the extraordinary landscape. Lot sizes vary among the enclaves and govern how the land can be used. Travel time from the Village of Galisteo to Santa Fe centro is approximately 25 minutes.